I decided to conquer another culinary challenge that I have been wanting to tackle for a while now, and that is learning how to fillet a fish. Went to Whole Foods over the weekend and saw a super fresh, whole Wild Red Snapper. I decided to get the smallest fish and give filleting a try. Turns out, I not only made one dinner out of one whole fish, but two! Before butchering the fish, I watched some videos on YouTube that gave me some instructions on how to fillet fish, particularly red snapper. If you plan to saute the fish in a skillet, be sure to score the skin to prevent the fish from curling up. Once you fillet the fish, remember to take out the bones. Run your fingers along the fillet and feel for bones, remove bones with pliers. In a small, heavy bottom pot, fry up chopped onions and carrots in olive oil. When they become golden brown, add couple of cups of water, salt, pepper, and bay leaf, and bring to boil. 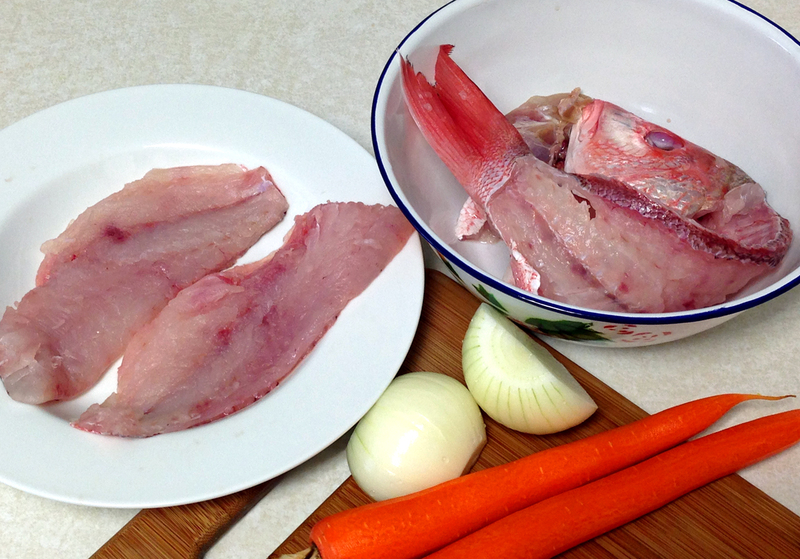 Add fish bones (with head), bring to boil, lower heat, and simmer for 45 minutes. Strain the stock, put back in the pot, bring to boil, add potatoes (cubed), cook until fork tender. Serve hot!